There are many ways to describe what it’s like to work for the ministry’s Commercial Vehicle Safety and Enforcement (CVSE) branch. Experienced and aspiring vehicle safety officers and inspectors now have the chance to add their skills to CVSE’s province-wide effort to make British Columbia’s highways safer. On the job: An Area Vehicle inspector works on the go, independently monitoring and inspecting vehicles, loads, licences, insurance, drivers and carriers to protect highway infrastructure, and the people who use it, through enforcement and education. This position also focuses on inspecting and certifying school buses for safety, and auditing inspection facilities. On the job: A Commercial Transport Enforcement Officer enforces compliance with the acts, regulations and standards that govern the road transportation industry, protecting travellers and infrastructure. Within the assigned area (there are openings from Vancouver Island to Northern BC) the position monitors roadways, operates inspection stations (stationary, portable and mobile) and conducts mechanical and safety checks on commercial vehicles. The officer also issues warnings and prosecution notices, and may delay or detain vehicles and/or drivers. On the job: A Carrier Safety Inspector independently resolves complex problems and applies decisions that significantly impact peoples’ lives and businesses by monitoring carriers and drivers to ensure compliance with the National Safety Code Program. As part of the monitoring process, CSI’s conduct investigations, interviews, inspections and quantifiable audits in accordance with national standards, and also provide training and seminars to industry and partner agencies. We need skilled people to join our CVSE ranks across BC, including the Lower Mainland, Vancouver Island, Southern Interior, and the north. Do you think you have the abilities and drive to help keep our roads safer? Please apply online by November 26, 2014. If you have any questions, please feel free to use the comments section below. hi there I’m currently looking to see if CVSE is hiring for the coming year in the lower mainland by any chance I’m currently looking for a career change if there is an opportunity available. There are currently no postings in place for the CVSE. Read this page to get more information about the skills you will need to apply for a variety of CVSE positions and visit the BC Government Employment Opportunities website regularly to search for postings. You can ask for notifications from this page for any CVSE posting when it goes live. Hope that this helps! Thanks for considering working with us. You should tell that officer at 100 Mile House to stop wearing baton and handcuffs (has a pepper spray pouch, but not sure if there is spray in it). Also, I see him stopping cars for speeding. I am familiar with the CVSA OOS criteria which I am pretty sure does not apply to vehicles licensed less than 5,000 Kg. Thanks for your comments and concerns about CVSE officers. CVSE officers do not carry or use items such as batons, pepper spray or handcuffs. An officer may choose to wear a duty belt equipped with pouches of various sizes and shapes to safely store the many tools which are required to do their job effectively and can resemble the carrying cases of the items which you mentioned. These pouches contain tools such as flashlights, seat belt cutters, first aid supplies, multi-tools and gloves. As Peace Officers in British Columbia, CVSE officers have the authority to enforce the Motor Vehicle Act which applies to all vehicles on our public roads. CVSE’s primary focus is to ensure the safe operation of commercial vehicles, however occasionally it is necessary to interact with a smaller vehicle to ensure public safety for all road users. Actually, I’m an experienced law enforcement officer. I am familiar with batons, handcuffs and pepper spray. I know what it looks like, I am not stupid. I have also carried that equipment myself. Considering I have seen his duty belt up close, I can say with confidence it’s baton, OC, and handcuffs. Doesn’t help that he probably got his belt from an ex-mountie. Qualifications may vary depending on the position you are applying on. Can a person with no experience Get in to cvse? You will find some information here, about the knowledge and abilities you need: https://bcpublicservice.hua.hrsmart.com/hr/ats/Posting/view/52007 NOTE: this information will be removed July 17 when the job posting closes, so you might want to copy it before then. Generally, we’re looking for people who hold a regular Class 5 drivers licence, have graduated from high school and have some road transportation and/or enforcement learning/experience. Completion of the Justice Institute of B.C. Investigative and Enforcement Skills Certificate Program core course is listed as one example of learning that would helpful for the position. Skills include reading comprehension, decision making, written and verbal communication, conflict resolution and self-control, problem solving, being able to work in a team environment and the demonstrated ability to read and apply legislative or compliance related material. Can I still join the cvse even if I don’t have any experience at all Or do I need to get some for them to even considering hiring me or can they trained me when I get hired ? I suggest contacting Steven.Bauer@gov.bc.ca to learn about ride along opportunities. I gave him a heads up that you are interested. Thanks for your interest in a career with CVSE. You will find some information here, about the knowledge and abilities you need: https://bcpublicservice.hua.hrsmart.com/hr/ats/Posting/view/52007 NOTE: this information will be removed July 17 when the job posting closes, so you might want to copy it before then. •	Current Job Postings (To search, enter “Commercial Vehicle” into the keyword section; and select “Min of Trans & Infrastructure” for Ministry/Organization). If you have more specific questions after reviewing this material, let us know. Thanks for your interest in working as a Commercial Transport Officer. 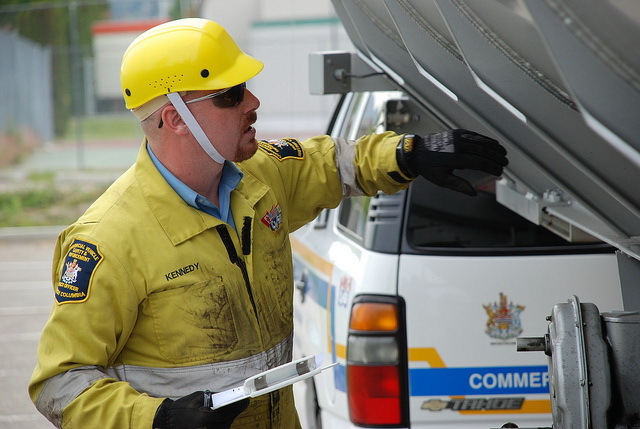 In the meantime, you will find some information here, about the experience, knowledge and abilities required for a Commercial Transport Enforcement Officer: https://bcpublicservice.hua.hrsmart.com/hr/ats/Posting/view/52007 PLEASE NOTE: this information will no longer be available after July 17 when the job posting closes, so you might want to copy and save it for future reference. For this position, we’re looking for people who hold a regular Class 5 drivers licence, have graduated from high school and have some road transportation and/or enforcement learning/experience. Completion of the Justice Institute of B.C. Investigative and Enforcement Skills Certificate Program core course is listed as one example of learning that would be helpful for the position. The work requires reading comprehension, decision making, written and verbal communication, conflict resolution and self-control, problem solving, being able to work in a team environment and the demonstrated ability to read and apply legislative or compliance related material. I checked with one of our CVSE people about the requirements for Area Vehicle Inspectors/Commercial Transport Inspectors, which I believe are entry-level positions. I was told they are included in the answer I provided to you earlier today, with the exception of the paragraph and job description that focused on the work of a Commercial Transport Enforcement Officer. Best wishes on your career quest! Ive applied for the last Commercial Transport Enforcement Officer position, and I was just wondering on average how long it takes for candidates to be notified if they have our have not been selected to continue and how long it takes on average for the successful candidate to receive an offer. The time it takes really depends, depending on the number of applicants, the workload of the hiring panel, etc. Do you have the name of the hiring manager? You could try to connect with them and see where they are at in their process? What kind of hours do CVSE employees work? Is it rotating shifts? Are you given options for shift choices if hired? Good question! Is there a specific job with the CVSE you are interested in? What is the hiring outlook for CVSE in 2018. Will there be any mass hiring? It seems like the majority of the 2017 postings all went to internal applicants. At this time there are no plans for a bulk hire in 2018. We encourage you to continue to check with the Employment Opportunities page for external positions as they come available. Good luck! It includes How to Apply and Current Job Postings links at top right of the page. I was told job shadowing was out of the question due to privacy concerns at my local CVSE station? Is this different region to region? Because I would really love a chance to shadowy an officer and see what is really involved day to day. We generally do allow job shadowing, and can limit access to personal information. What station did you communicate with? The weigh station I inquired about is in Quesnel. I have been applying for positions with CVSE for a couple of months now ( including writing the online exam for one position – unsuccessful ) . I also have been doing a few days of job shadowing and am currently in touch with the new supervisor in my local area to further my knowledge and do further shadowing and ride along . I have also ordered a hard copy of the Vehicle Safety and Inspection Standards Legislation Manuel to study at home . I meet the qualifications for a position and have 30 years experience as a log truck driver . My question is : does CVSE prefer to hire younger applicants over someone my age ( 54 ) ? I have been interested in joining CVSE for several years but just recently ( January 2017 ) got serious about applying . Also , do you have any advise as to any further training I could do on my own to better my chances of gaining employment with CVSE .Thank you for any information or help you can supply . We have sent your question to the CVSE. Stay tuned! We spoke with the CVSE who told us that general learning/experience that leads to success are skills involving reading comprehension, decision making, written and verbal communication, conflict resolution and self-control, problem solving, being able to work in a team environment and the demonstrated ability to read and apply legislative or compliance related material. This is beyond the standard experience in road transportation and/or enforcement that may initially get a person in the door for testing, but our hiring processes are highly competitive and the above noted competencies are of significant importance. Age is not a considering factor, other than being of minimum age to work in the public service. We’ve hired officers from early 20’s to late 50’s. For contact, you are best to continue with local contact with the district or region you already have initiated. Thank you , I will look into what is expected for the competencies and see what I can find to learn more . Curious if there will be any Hirings any time soon. I am really interested in a career with the CVSE! Thanks for your interest in working with us! There is currently a posting for a Commercial Transport Program Officer in Dawson Creek. We encourage you to check back on this website from time to time. We have also created a CVSE Career Page to help you get a better understanding of the types of roles we regularly fill and what skills you should have to be considered for those roles. When is the opening for school/ training each year? That date will vary depending on the school you are looking at. We recommend connecting directly with them. Thanks for connecting with us here! Any bulk hiring happening for CTEO’s this year? wondering if there are any positions available for carrier auditors, I have heard that the audits are very far behind. Do you contract out audits at all? It looks like we’re not looking for this position at the moment but please check back to the site in future. I see that CVSE recruiters will be attending the open house that the JIBC is hosting tomorrow. I would love to attend an event like this but due to my location in Golden it is not possible, are there other ways to connect with a recruiter outside of these types of events? We have sent your question forward to the good folks at the CVSE. Stay tuned. One of our CVSE folks will be connecting with you directly (if they haven’t already). Thanks for connecting with us here and good luck! We currently have no bulk recruitment timelines in place for 2016, but we do encourage you to keep an eye on the government postings website (https://search.employment.gov.bc.ca/cgi-bin/a/searchjobs_quick.cgi). You can also speak with local CVSE staff about job shadowing opportunities. Hope that this helps! I would like to inquire about the cvse opening in Quesnel BC. I am currently a class 1 driver and would like some information about changing careers? I have had a pleasure of working roadside with CVSE members at few occasions. I am an RCMP Auxiliary Constable in LMD and I have developed strong interest in traffic services. – Any ideas of when new postings might open again? – I am guessing, applications aren’t acceptet until postings open? Thanks for connecting with us here. Unfortunately we are not currently accepting applications for the CVSE, but we encourage you to visit the BC employment opportunities webpage and register for notifications there so that you will know as soon as the next opportunity is posted. Good luck and thanks for your interest in working on our team. Thanks for your interest in the CVSE. This competition is now closed. The minimum education requirement was high school graduation, not university. Hey there, I am quite interested in becoming a CVSE inspector and was wondering if there is a way to find out if applications are still being accepted? Also wondering if there is a office or branch I can call to “shadow” an inspector to confirm that this is going to be the right career for me? Any help would be great! Thank you. Hello.. I’m curiouse to know what type of training or what someone would need to qualifie for a CVSE career? •	Must maintain an active/adequate level of physical fitness. Hope that this helps, let us know if you have any other questions. I’m interested in an immediate or near future “weekend only” position and not sure where to start! Any guidance would be appreciated. Been interested in this for quite awhile and woul definitely like to apply later on down the road opportunity presents itself again. I am sort of quizzicle about something, though. CVSE Officers do a wide range of work and take part in a variety of road safety initiatives. Having said that, I was told by an officer that radar for catching speeders isn’t mandatory training and only certain officers get it. If that is true, why? Does catching drivers unsafe commercial drivers who aggressively speed and endanger other road users not matter to the CVSE? While many of our officers are trained and certified for speed enforcement, not 100% of all CVSE officers are; This is generally because of the different type of work done by each type of officer. Our investigational and auditing based officers generally do not, nor do inspectors that do not operate our patrol vehicles or work roadside on a regular basis. Speed enforcement, along with enforcement other driver behaviour offences, are mainly focused on the work units that spend the majority of their time out on the highways, conducting roadside enforcement on a regular basis. While there are the odd exceptions, that’s the situation across the province. Similarly, only some of our officers receive specialized auditor training, but only those that conduct compliance audits as part of their daily duties. Hope that this helps! Thank you for connecting with us here. When will CVSE be posting new job openings? Hi, i was wondering what the structure is for training once hired. Is it mostly in house training or is the majority done face to face at the JI in vancouver? Good question Graham, we have sent your inquiry to the CVSE for clarification. Stay tuned. The structure for training will be a combination of Justice Institute and on-the-job training provided to each candidate after they start. Thanks! I have a question pertaining to a CVSE posting I have applied to a month ago. Is there someone I could contact to follow up on my application status? Hi Darryl. We suggest sending the hiring manager your question. Her email is Chantelle.Gergley@gov.bc.ca. Thanks. I am wondering how long you will be accepting applications? Hello I have a question regarding the Area Vehicle Inspector position & the salary range posted: $58,332.28 – $66,652.94 annually. Is there a graduated pay scale for the first 5 years? I am a currently working as a Fleet Inspector at the R24 level. There was a graduated pay scale for the first 5 years of my employment with the BC Government. Are these the same terms of employment and if so would I be subjected to this process again? We suggest connecting directly with the hiring manager with your question. Her email is Chantelle.Gergley@gov.bc.ca. Thanks! Also, if possible, how does one go about requesting a some time job shadowing or riding along to make sure we would want to continue with an application? What requirements do an out of Province applicant need? What are the specfic steps of the hiring process? Also, do you know how many positions are expected to be filled in each area? There’s a few steps in the hiring process and as for the number of positions, that’s being determined through the process. I’ll have someone follow up with you through your email. What can I expect to find on the testing stage? •	A physical demonstration of your ability to crawl, climb and maneuver your way around large commercial vehicle during a mechanical inspection. What is the hiring process to become a CTEO with CVSE? If you are interested in applying, visit this page and make sure you have all of the qualifications. Once you have confirmed that – we encourage you to apply and hope to speak with you during the interview process. Does that help? I have my red seal in commercial transport and I have my cvip licence. Anything else needed for the career? Im very interested!! Please visit the postings for more detailed application information. Thanks!